Pinguicula gigantea and other blooms |Sundews Etc. 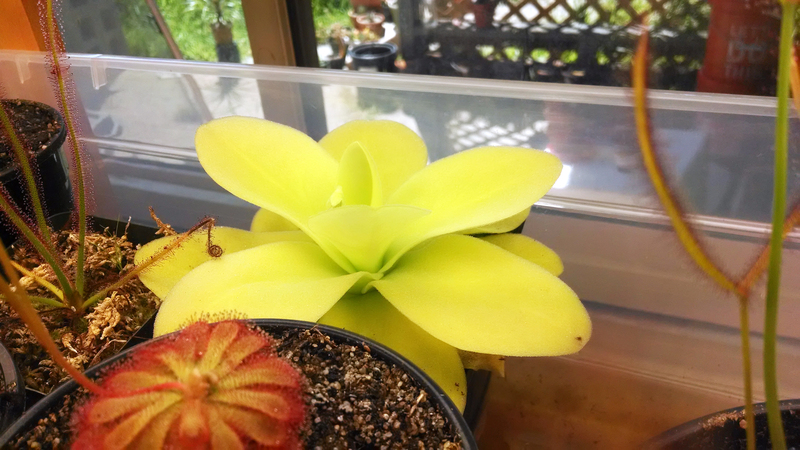 I noticed something exciting on my Pinguicula gigantea. First of all, it's bigger than I remember last checking, although I don't have many photos to compare it with. At the very least it's looking quite happy. Probably growing some larger summer leaves. Pinguicula gigantea splaying out a bit. It's sort of hard to get a good picture of this Ping because it's all one color and its outline is fuzzy. Second, do you see anything peeking out from the crown of the plant? Let's take a better look. Flower stalk on P. gigantea making it even more adorable. It's a flower! I hope the flower stalk grows longer, so I can see it a bit better. 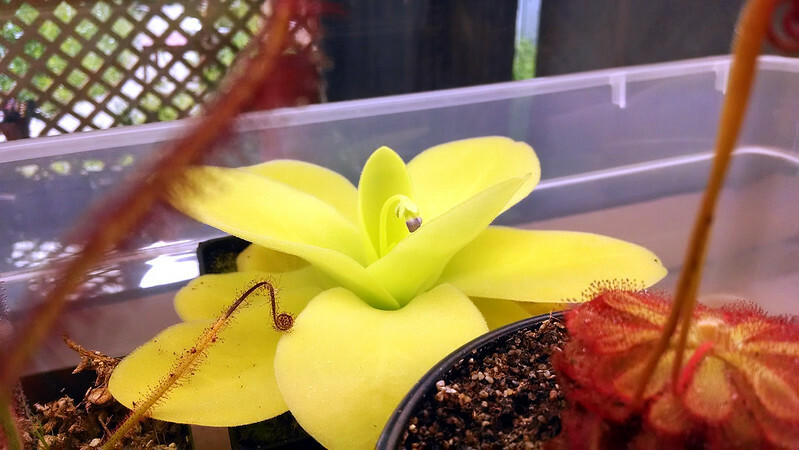 I also hope it hasn't bloomed out already – this is my first Ping bloom so I don't really know how it goes. At any rate, it seems to like my conditions well enough, which is great. I haven't blogged much about my P. gigantea, but it's one of my girlfriend's favorite of my plants. I think she partly likes it because of the cute, almost fuzzy-looking leaves, and partly because she finds the common name – Giant Butterwort – hilarious. I also managed to catch one of my Drosera intermedia 'Cuba' plants with an open flower today. I've counted at least 5 seedlings with flower stalks, which is quite exciting. Tiny flower on D. intermedia 'Cuba'. The plants have gotten quite red since last I fed them. 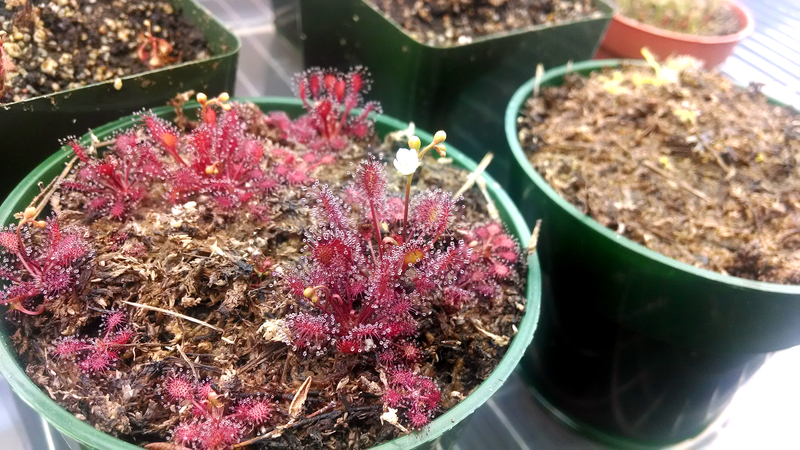 Finally, that Drosera binata var. multifida f. extrema with the flower stalk I keep threatening to cut has been rewarding my procrastination with lovely, fully-open blooms 2 days running now. First, here's the plant with the stalk going up the middle. 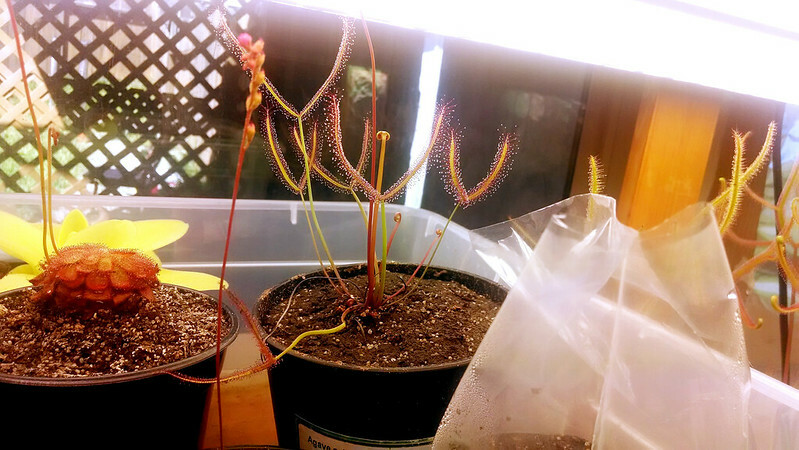 Drosera binata var. multifida f. extrema. Very pleased with how it's doing! It's looking quite nice now, with robust dew production and lots of new leaves, in addition to the scape. Because of the position of my lights and the height of the pot (and my unwillingness to do a serious shuffling of plants in my tray) I couldn't get a full-on shot of the whole thing. 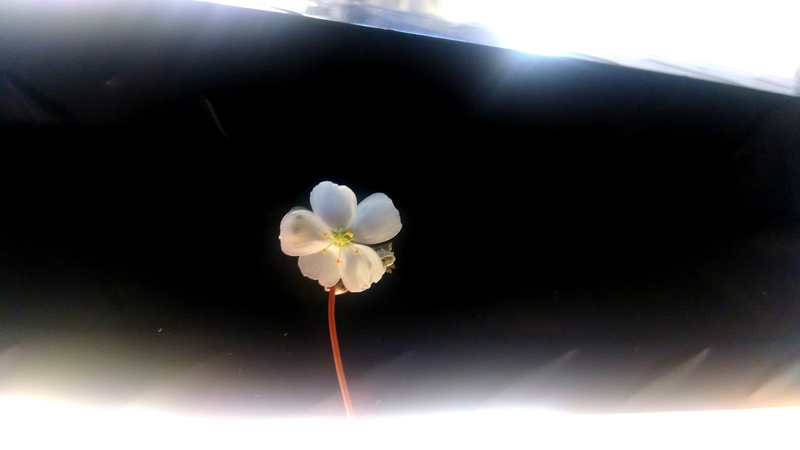 However, I did capture a very nice closeup of the flower silhouetted against the casing of my lights. D. binata var. multifida f. extrema flower beauty shot. Well shucks, if it's gonna be this cute I may not have the heart to chop it all up for cuttings. We'll see.